File Transfer Protocol (FTP) is a secure method for transfering files across a network. Some FTP servers allow an anonymous connection, but many require that you enter the user name and password for the FTP server when connecting. We can use a flow to upload a file to an FTP server, using the authentication information you specify. To use a flow to upload a file go into the Flow Designer. In the Steps	panel, expand the category Integration > FTP	and add an Upload	component to the workspace. 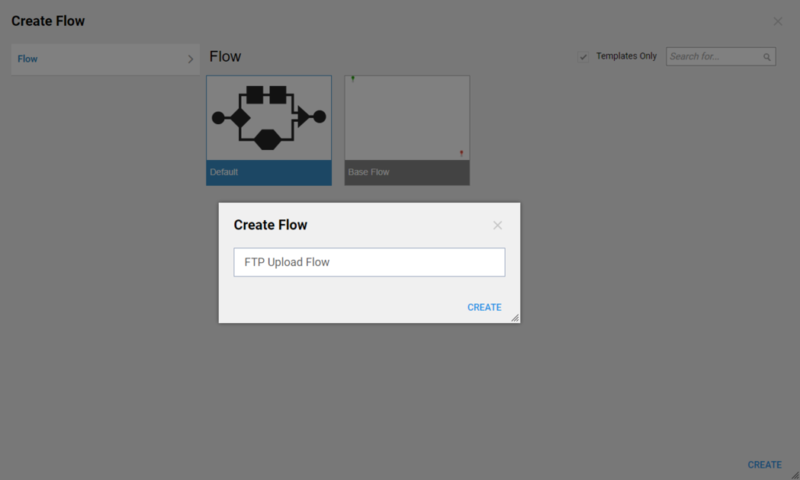 In this example, we will create a flow to upload a file via FTP. The only prerequest for this example is an FTP site. To begin, navigate to a Designer folder and click theCreate Flow	button. Give the flow a name and click OK	to open it in theFlow Designer . In the Flow Designer&apos;s Quick Add window, expand the category Integrations > All Integrations > FTP	, and select an Upload	component. Click Add	to add it to the workspace. This flow has only one step. Connect the Upload	step to the End	step. 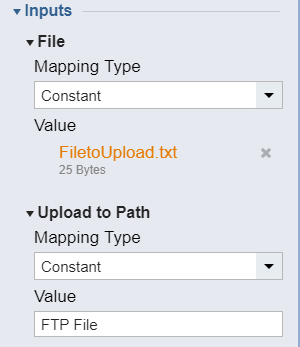 Set the values for FTP authentication and connection, and select a file you would like to upload. In the Properties	panel, in the FTP > Server > Authentication	section, complete the Username	and Password	fields for the FTP account. In the Host	field, enter the Host name of the FTP server. In the section Inputs > File	, select Constant	from the Mapping Type	drop down list. To select the file to upload, we can either Drag a File	into this space or select Choose File	. For this example select Choose File	. Select a file to upload, and click Open. In the sectionInputs > Upload to Path	, enter a name for the uploaded file in the Value	field. To access the file once it is uploaded, the user will look for the file in the FTP directory on the FTP server. This completes the flow. Save it and run it in the Debugger. The file upload may take longer than expected depending on network traffic and transfer speed. The flow is complete. The file selected in the flow is uploaded successfully to the FTP server.